Each month at FSO we build new businesses from Scratch in 30 days – The Bizathon Challenge! And yesterday we covered 7 Shopify Mistakes to Avoid If You Want Sales. Now we’re revealing how to find “Converting Shopify Products” to sell in your own store. All it takes is one winning product to have a successful online business. Once you find the first winner it’s much easier to quickly scale your store to 5 or 6 or 600 successful products from there. I’m not saying you’re going to launch a store and immediately make a million dollars. But we are going to test 15 products and show you how to take a positive step toward that 7-figure payday. As you implement the techniques we’re showing you, be sure to keep track of any URLs of products you want to promote. First things first, we need to see what’s already working on Shopify. Now you can see the bestsellers for any Shopify store. Utilize this technique to help populate your own store for our 15 product test. Our journey now takes us to AliExpress – an online retail service made up of small businesses (predominantly in China but elsewhere too) offering products to international online buyers. AliExpress has more sellers drop-shipping products than any other company. And we’re going to locate hot sellers to offer on our own Shopify store as part of the initial 15 product test. Click “Best Selling” from the homepage. This will reveal two tabs – ‘Hot Products’ & ‘Weekly Bestselling.’ Either of these tabs will reveal top selling products in real-time. Now scroll through making now of the URLs to products you like. I would avoid Halloween products on this short of notice. Sometimes shipping can take longer than anticipated and you don’t want unhappy customers. It doesn’t just apply to Halloween, never sell holiday products on short notice. 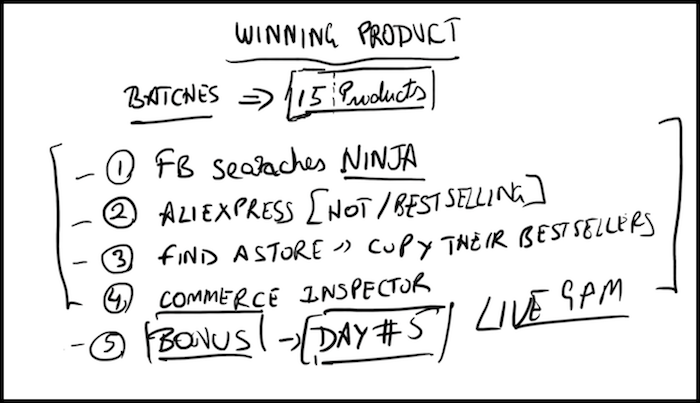 Facebook will play key roles in your Shopify store success, so I’ll be mentioning it often. Begin by logging into FB and clicking their search bar at the top. Edit the date to the current month from the lefthand sidebar. The goal here is to locate products with a large amount of shares and likes within a relatively short period. Click on the date of a post with many shares to locate the URL of the product it’s promoting. You can use the exact same technique but instead of selecting “posts” you can choose videos. Login to FB and click their search bar at the top. Now focus on identifying product videos with high amounts of shares. Don’t choose product posts or videos that first appeared multiple months or more ago. Other sellers likely already saturated the market on those particular products. If you’re not already using Chrome as your web browser, you’ll want to be so you can take full advantage of this one. 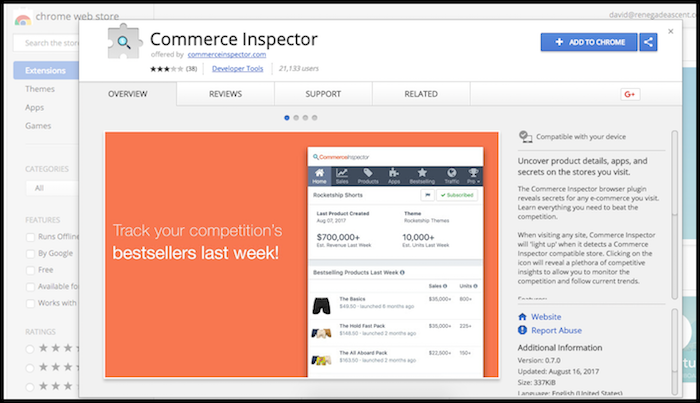 After you’ve installed Chrome, install the Commerce Inspector Extension. You’ll now be able to see all sorts of intimate data on any store. You can discover when certain products first began selling, revenue, units moved etc – all in real-time..
After we decide on the 15 products to promote as part of our test batch, we’re going to create a FB ad for each. This will reveal which product converts best. But we’ll cover that in an upcoming post. That’s a wrap for Day 4 – Great work! P.P.S. Click here for Day 5! Hi Ritoban. Thanks for sharing all this good stuff. Please which livestream platform do you use with youtube? Is it Webinarjam or GoWeninar? Which one please? And how do you set it up? Please share with me a tutorial, if you can.